If you are a poker fan, playing poker is one of your favorite pastimes. Whichever version you like to play (5-card draw, Texas Hold’em, Omaha, 7-card Stud, etc. ), you have good reasons for choosing that version. Weekly games with friends tend to be the norm among poker lovers. Every now and then, though, the same old routine might get a little humdrum. It is nice every once and a while to switch it up a bit. Have you ever heard of Three-card Poker? This version of poker has become very popular lately in casinos, and is now all the rage online as well. Silver Oak Online Casino has its own rendition of this great game called Tri-card Poker. Let’s talk about how to play Tri-card Poker for a minute. This game has gained a lot of popularity recently due to the fact that it has the gameplay elements of poker mixed with the speed of blackjack. Moreover, the rules and the gameplay are really easy to learn. As a matter of fact, by the end of this little article you should have a good idea of how to play and can go try the game right after. Winning the game should not be difficult to understand. You need to make the best three-card hand. Now, this may take some getting used to due to the fact that poker is usually played with five cards, but this is not a complicated aspect of the game at all. The first thing you need to know is that you have three different types of wagers. These wagers and deciding if and how to play them are parts of the skill aspect of the game. The first play you have to make is the Ante wager. This must be done before anything. After that, you will receive your three cards. From there you must decide to play or fold. If you decide to play, then you must place your Play bet. This bet must be at least equal to the Ante bet. Playing against the dealer involves a special rule for them. The dealer must have at least a Queen in the opening hand in order to play. If that is not the case, then the players get their Ante back along with their Play bets. If the dealer’s hand does qualify, then the winning hands are determined and the payouts are handed out. There is one other bet that players can make. This is the Pairs Plus bet. This one is very easy to understand. 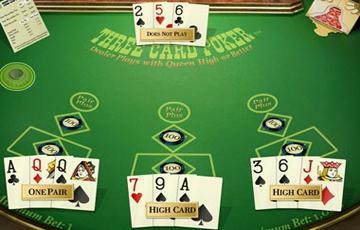 Basically, it is a side bet that a player can make that wagers in favor of receiving a pair in your opening hand. Each casino has a varying payout chart for this so be sure to check that before you play. One thing new players need to be aware of is the different payout ranks in this game in comparison to poker. A straight pays more than a flush. This is because in Three-card Poker, as well as in Tri-card Poker, a flush is considered easier to attain than a straight. One other thing players should be aware of is that there is a special bonus involved for certain hands called the Ante Bonus. You will win this bonus if you get a straight, three-of-a-kind, a straight flush, or a mini-royal flush. Basically that is all you have to know about playing Tri-card poker. Go ahead and give it a try with us here at Silver Oak. We know you will love it. And if you ever run into Three-card Poker in a land-based casino, give it a whirl, too!